I have enjoyed building my own track since High School. When I switched to O scale I discovered that laying my own rail was for me, however, a financial necessity. But laying rail is not difficult, just takes a little practice, and for me is one of the most satisfying parts of the hobby. There have been many articles in hobby press on hand-laying track and switches, but not much on cutting, or gluing, of ties. With the amount of track on the A&O railroads, purchasing ties was cost prohibitive. Besides, I already had a table saw! So here is a brief description of how to go about spending some time, but saving lots of $$ by cutting your own RR ties. WARNING!!! The following description assumes a certain degree of comfort and competency in working with a table saw. Working slowly and deliberately is absolutely necessary to keeping all body parts attached. Generally a 4' length is the longest I want to run through the saw, but on occasion a 6' piece meets the criteria for clarity and straightness, so that piece is simply cut in half before cutting. For cutting ties, vs ripping wood, I use a "Fine Finish" carbide tipped blade. It is worth spending a few bucks to get a good quality blade that will not go dull and overheat. Begin by setting the saw fence to the height of a RR tie. Because the ties will be sanded level before rail is laid, I tend to make my ties a bit thick which gives me room for sanding them down. 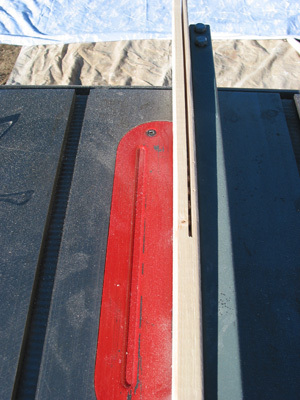 With the Fine Finish blade, two passes through a 1x4 yields three pieces of tie-height wood ("flats"). Work slowly on each pass, so as to not bog down the saw motor and letting the blade do its work. This is slowest part of the whole process. Next the wood flats are clamped together in bundles of 6. There will be some width variations, but have one edge be flush across its surface (the photo shows the bottom edge being made flush). It is helpful to select a pair of wood flats that are free of knots and place them as the outside pieces of each bundle. Later on this will keep debris from flying when these flats are ripped into tie strips. Then tightly wrap the bundles with masking tape about every 4" and remove the clamps. 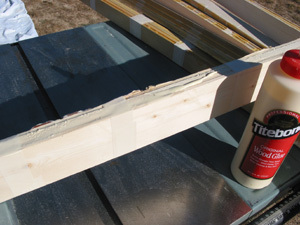 Titebond or similar yellow carpenter's glue is then applied the length of the bundle. The glue is put on the uneven edge. I use my finger to rub the glue fully onto all the exposed edge surface. After the glue has dried, I cut the tape away from bundle with a utility knife.What remains is sort of like a book with the wood flats being the pages and the glued edge being the binding. 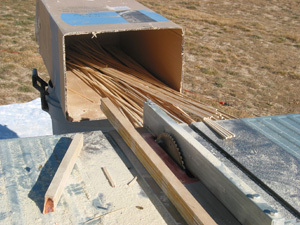 Each edge-glued bundle is pushed through the saw with the glued edge remaining uncut. It is helpful to have a clear, knot-free side up when making this cut. Small knots in the wood are thus held in place as they go past the blade by the intact wood above them. Work slowly, even though these glued wood flats cut easily. To catch these long ties as they come off the saw I place a stereo speaker box on saw horses. The ties slide into the box with each pass through the saw. 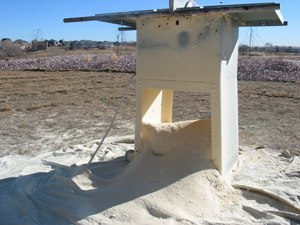 Strips with knots will break apart yielding shorter strips. No problem. They'll all work. The next step is to bundle the ties for cross-cutting. 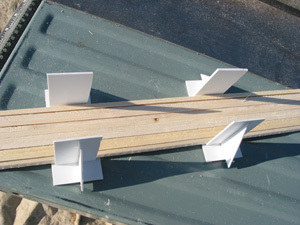 A pair of home-made styrene cradles help establish a flat base for the tie bundle. Tie strips that are shorter due to knots are collected and made into shorter bundles. Masking tape is now tightly wrapped around the tie bundle, making sure the flat bottom remains. I usually keep the tie bundles to around 1 1/2" in height. Once the end is tightly wrapped, the remained of the tie bundle is "Barber Pole" wrapped to the opposite end, where it it again tightly wrapped. The bundled ties are now ready for cross-cutting to length. 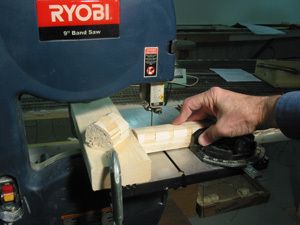 Cross-cutting to length is done on a band saw. 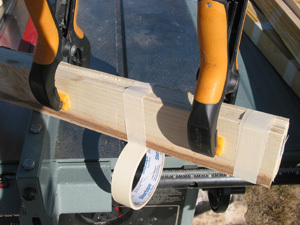 A wood, 2x4 fence is clamped to the saw table top the length of the tie. In O scale this is 2" for an 8' tie, or slightly more if you're doing 8'6" ties. The ties are pushed past the blade with the flat bottom down (who'd a thought). Switch ties of 16' or longer are also cut. The tie bundles stack up, with each bundle being about enough for 3' or more of track. Not bad! Next- Gluing down the 'right-o-way'.